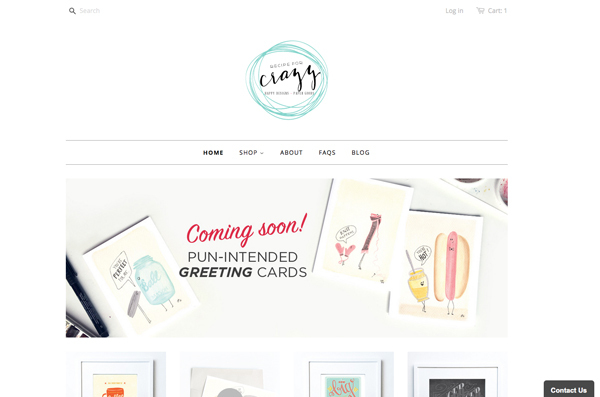 recipe for crazy blog: The new site is LIVE! After weeks and weeks of working on transitioning my etsy shop to the new RECIPEFORCRAZY.COM site, it's finally LIVE! I'd love to hear your feedback. And as a kickoff to the new site, you can get 20% off all purchases over $25 with code WEREBACK when entered at checkout. There are just a few flat, 5x7 pun-intended cards left. The new cards, including all the new designs, will be folded greeting cards and they will replace the flat cards. They are currently at the printer so I'll let you know when they arrive in the shop. That said, if you're wanting the flat cards you better get what's left before they're gone! Also, you might notice the shop is located where my blog used to live. I didn't 100% think it through that when I moved the shop to recipeforcrazy.com that there would be some issues with moving my blog. So. Lesson learned. If you have saved links to certain posts and get the pesky 404 error message, sorry about that. Not the best move on my part but you can easily access the pages by putting blog. in front of recipeforcrazy.com/whateverpostitshouldbe. If there are any web experts out there than can help me figure out how to redirect incoming links to the new address, I'm all ears!